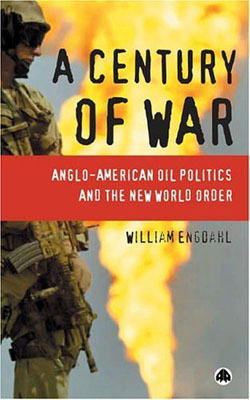 "A Century Of War : Anglo-American Oil Politics and the New World Order"
"A Century Of War : Anglo-American Oil Politics and the New World Order", written by William Engdahl, a German historian, covers how oil and politics have been intertwined for the past 100 years. Below I have included a passage extract, concerning Iran, taken from this book. The author obviously has bought into the popularized version that the CIA re-instated the late Shah of Iran in 1953 when this is far from the truth as I have discussed earlier in my blog posts. What is interesting in this book though is how the author outlines the mechanisms that were put in place to undermine the Iranian Government, under the leadership of the Shah of Iran, and to support the radical opposition groups that worked against the Iranian state. I did not know it then – perhaps I did not want to know – but it is clear to me now that the Americans wanted me out. Clearly this is what the human rights advocates in the State Department wanted … What was I to make of the Administration's sudden decision to call former Under Secretary of State George Ball to the White House as an adviser on Iran? … Ball was among those Americans who wanted to abandon me and ultimately my country. The Carter administration's Trilateral Commission foreign policy further ensured that any European effort from Germany and France to develop more cooperative trade, economic and diplomatic relations with their Soviet neighbor, under the umbrella of détente and various Soviet-west European energy agreements, was also thrown into disarray. -- William Engdahl, A Century of War: Anglo-American Oil Politics and the New World Order, © 1992, 2004. Pluto Press Ltd. Pages 171-174. Journalists, academics and students of the world, where the HELL are you?! -1953 peoples' uprising against Mossadegh which has been popularized by the BBC and likes as the "1953 CIA Coup"
-Exaggerations on SAVAK's "brutality" against groups that were working against the national interests of Iran; ignorning crimes a thousand times worse by the west's own intelligence services in which 30 years later we still deal with organizations like the CIA conducting torture (for good or bad) - so God forbid though that a developing country 50 years ago used torture against people seeking to undermine the state! -Criticizing the Shah's military might when in the end it was the few remnants of that military machinery which helped Iran repel the Iraqi invasion (after the mass-executions of Iran's finest military leaders and complete chaos in the military make-up). Noteworthy is also that the Shah knew that Iraq would attack Iran if the country's guards were let down. -And lastly portraying Iran as poverty-stricken country in which only a select few on the top were prospering - conveniently neglecting the fact that this was not at all representative of Iran in the 1970's but that Iran had a thriving middle class and the nation as a whole was prospering. This was the BBC's gift to the Iranian nation (or slap in the face if you like) on the eve of the Islamic beast which they helped bring to power. Ironically they even mention in their documentary that this was the first "revolution" that was televised! Ironically this is very true as the BBC acted as the Islamist and Leftists' mouthpiece through which they were able to influence Iranians with their propaganda against the state. The last part of this two-part series, I believe, will be on BBC (World) next week Saturday at 21:10, if anyone wants to analyze the BBC's historical revisionism and propaganda methods. UPDATE 1: Frédéric Mitterrand in conjunction with France3 will soon be airing a documentary on HIM Shahbanou Farah Pahlavi of Iran. For further information CLICK HERE. will be aired on France 3 TV February 21 at 21.45 pm Paris time. This is a compilation of clips from Iran in the 1960's and 1970's. This is Iran before the Islamist/Leftist takeover of the country in 1979. A country that was progressing, modernizing, and prospering - with a thriving middle class established thanks to the efforts of the Pahlavi dynasty. An Iran where men and women were equals as they should be and had been 1400 years ago before the Arabo-Islamic invasion and subsequent occupation of Iran (Persia). The Pahlavi Era was the first time since 1400 years back in history that Iranian women were re-established in society as equals and the first time Iran once again had a crowned Empress. This was a stable, secure, and peace-loving Iran, guided by a patriotic Emperor whose goal was to reassert Iran's rightful position amongst the world's nations. This was the Iran that was destroyed in 1979 by the foreign-backed muslim and leftist guerillas/mobs. This is the Iran which the enemies of Iran do not wish to see. My generation was deprived of living in this Iran. My generation is called the burnt generation in Iran. 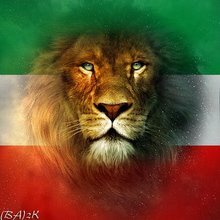 I watch these clips and my determination in contributing towards the fulfillment of His Imperial Majesty's vision of a modern, progressive, prosperous, and stable Iran at peace with its rich culture becomes ever stronger. This recommended page monitors international companies that do business with the terrorist occupational Islamic establishment in Iran. It's aim is to put pressure on these businesses and the terrorist Islamic Republic by bringing these relationships into the public eye. These companies are aiding an illegitimate TERRORIST regime through the lucrative deals which they conduct and their business dealings must be exposed for the public to judge. "Welcome to United Against Nuclear Iran’s (UANI) Iranian Business Registry (IBR), a running database of reputable media and academic reports of international business in Iran. Iran is uniquely susceptible to financial pressure and we hope the IBR can educate investors, policymakers, and other individuals on companies reported to have been doing business in Iran. If you have further reputable reports of international business activity in Iran or have questions regarding any of the reports, please feel free to contact UANI - we welcome all input." Given that the website is named "united against nuclear iran" I would like to clarify my position vis a vis this issue. My position on nuclear technology in Iran is that I fully support Iran's right to have nuclear energy as an alternative energy source and in terms of its military use that is something which I believe a responsible Iranian government has the right to have if deemed necessary for DEFENSIVE purposes - in the same light that countries like Israel, U.S.A, Russia, India, Pakistan etc have their own. What I am fully against and opposed to though is a TERRORIST, RECKLESS, SAVAGE, INHUMANE regime, like the Islamic Republic occupying Iran, having access to any nuclear technology which in their hands WILL endanger Iranian lives! I believe my stance represents the majority of freedom-loving patriotic Iranians. Click HERE to read an entry by my fellow blogger Potkin Azarmehr, who does an excellent job in delivering a status report 30 years after Leftist/Islamic alliance violently took to power in Iran. The former empress of Iran, Farah Pahlavi, is the subject of a newly released documentary from an unlikely source -- Iranian-born filmmaker Nahid Persson, a former communist who took part in the 1979 revolution. "The Queen And I" follows the former empress and her onetime opponent as they share ideas and concerns about the country they were both forced to leave. Farah Pahlavi speaks to RFE/RL correspondent Golnaz Esfandiari about her decision to participate in the documentary, screened at the Sundance Film Festival in January. RFE/RL: Why did you agree to take part in "The Queen And I" -- the documentary by Nahid Persson, in which you are the subject? Farah Pahlavi: I always have a positive view and affection toward my countrymen, especially those young artists who have been successful inside and outside Iran. So, when Nahid Persson asked to do this -- since I had seen two of her documentaries, including one about prostitution in Iran, which was very painful but she had done it with courage, and also another one about a man in Iran who has four wives and wants to marry a fifth -- because of that I accepted to work with her and participate in the documentary. RFE/RL: Were there any moments when you regretted your decision? Pahlavi: Yes, this comes also in the movie. After some time [working together], I received several e-mails informing me that she was a communist in her youth, she was a member of a communist group that I hadn't heard of. Naturally I started having doubts, and I thought to myself, "All these 30 years, with all the problems, all the attacks against me by the Islamic republic or negative articles by opponents, all these years I did my best to tell, in hundreds of interviews with TV networks, press and other media, what I see as the truth and realities of the monarchy and also the realities of today's Iran." I had doubts because the person who makes a documentary is in charge of the camera, filming, and also editing, so I was a bit concerned. I thought to myself, "This lady was young and was unfortunately from a [low-income family] and at that age and that time, they would think that communist ideas would bring justice and equality." And all the slogans at that time were about freedom. But I have traveled to [former] communist countries and there was no sign of social justice or freedom. Then I thought, "Why shouldn't I have a dialogue with people who in the past had different political opinions?" What is important for us is that we're Iranians and we have to think about Iran's future, and I know that some of those who were part of the opposition have come and said with courage that they are sorry for what they did. It's true that there were some shortages at that time, but there was no need for such a horrible revolution. Of course, there are also those whose opinion will never change. RFE/RL: What would you describe as the biggest highlight? The most interesting part of the documentary? Pahlavi: For me, the interesting thing about this documentary is that two people in different positions and with different political ideas can talk to each other. In the documentary we don't have an official meeting, we talk to each other, we tell each other our problems. I think in that sense it is interesting, but I leave it to the audience. Everyone might see a different thing in the documentary. RFE/RL: How was your first meeting with Persson? Did you feel you were meeting someone from another world? Pahlavi: Even in the past, during the monarchy, some of our ministers had a communist or leftist past, so it wasn't the first time for me. At first when we met, we didn't know each other. Aside from the differing political views, it takes time to get used to a new character and personal behavior. When we slowly got to know each other, it was easier to talk. It's been 30 years that I haven't had the status I once had, yet I still have a special feeling for my countrymen. RFE/RL: Have you seen the final version of the documentary? What did you think about it? Pahlavi: I've seen the final version. Certain things are said there; there are certain issues that I don't agree with. To a certain degree she was free to do this, but I wished she had given me the same opportunity as she had given to herself to express her views when she was by herself, so that I could have also expressed my views. And I think it would have made the documentary more interesting and it would have been more fair. RFE/RL: Could you give us an example? Pahlavi: Well, for example, the notion that were no political freedoms in the past. I've said it myself in many places that the conditions of the country were such that, at the time, it was not possible to guarantee those freedoms and the late Shah [Mohammad Reza Pahlavi] always used to say that after him, his son, the prince, would rule differently. And there were scenes that didn't make me happy, but one cannot be content about everything. I have given many interviews during these years, but I never knew what the results would be. I always express my views -- but a journalist, a filmmaker, also adds his or her view. RFE/RL: What is the message of the documentary in your view? Pahlavi: For me, the most important thing is that we're two people who have or had different political philosophies or views -- maybe we became closer. We have to think about Iran's tomorrow, we have to think about Iran's today, and we have to put the issues we had in the past behind us. I think this is the documentary's most important message. I am sure that what may be an issue for some of us is not an issue anymore inside Iran. For the women of Iran, for Iran's young people, for Iranians from different classes and groups -- they want to have a better life, they want to be able to make a living, have jobs and a comfortable life, they want to be able to live freely, have better health care. You know, these are more important for Iranians inside the country than ideas and differences that we had 50 years ago. RFE/RL: The 30th anniversary of the Iranian Revolution is being celebrated these days. What are your thoughts on this? Pahlavi: Sometimes I can't believe that 30 years have passed, because I still live everyday with the thought of Iran and Iranians on my mind. I naturally think, like [many] Iranians, that if this horrible revolution hadn't happened, our country with its immense national wealth, natural resources, and its human richness, what a place it could have had in that region. It's really regrettable after what happened to the security of Iran, and the region is threatened, and its threat has reached the world. I am really hopeful and I will not give up hope for the freedom of Iran, for the improvement of Iran's situation. I hope that Iran will regain the respected place it had in the international community -- and I greet all the women and young people; workers and intellectuals and villagers; and all Iranians who, despite all the problems and pressure, are still fighting to have a better life and for the future of their country. I always believe that light will win over darkness. UPDATE 1: BBC interview with Empress Farah Pahlavi (in persian) can be found HERE. 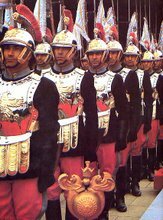 Please see fellow blogger SarbazeKuchak's blog on the Islamic Republic's stepped up anti-Pahlavi propaganda efforts during the terrorist regime's month of celebrations commemorating their takeover of the Iranian state. This is how they try to brainwash younger generations to fall in line with their ideology through constant historical revisionism, lies, and exaggerations. 11 February, 1979 - Iranian Army command commit treason by declaring neutrality against the muslim and leftist guerilla forces, consequently leading to the takeover of the entire state by these terrorist entities. The occupational forces of the Islamo-Leftist alliance declare an Islamic Republic and commit mass executions of Iranian statesmen, military officials, and other personalities loyal to their King and Country. Ever since an Islamic occupation has been in place in Iran, with terrorist forces in charge of all government institutes and security forces. 30 years of death, destruction, thievery, and misery will have passed on this date this year. Will there be an IRI 5.0?! The Supreme Leader of the terrorist Islamic Republic occupying Iran have a laugh on how well they have fooled the Iranian nation and western audience with the idea of presenting their terrorist theocratic system with the notion that there exists a "conservative" and "reformist" faction within this very system, when in fact both these actors (reformist/conservative) are die-hard loyalists sworn to protect the very same terrorist regime and its anti-Iranian foundations!